April is National Poetry Month. That’s why we’ll be reading books full of rhythm and rhyme this morning, including selections from the brand new collection, I’ve Lost My Hippopotamus, by Jack Prelutsky. It will be noisy and neat, sibilant and sweet, and when we’re done with poems and all, we will write some more to hang on the wall! This morning at 10:30 AM. 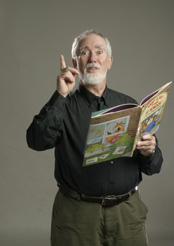 Jack Prelutsky is currently considered a "single author." If one or more works are by a distinct, homonymous authors, go ahead and split the author. Jack Prelutsky is composed of 7 names. You can examine and separate out names.